Android Studio is the new integrated development environment (IDE) fast replacing Eclipse. Android Studio is based on the IntelliJ IDEA Community Edition, a Java IDE by JetBrains, for developing for the Android mobile platform. It provides access to the Android developers‘ tools for development & debugging, helping you to design, test and monetize your Android apps. It was introduced at the Google I/O 2013 conference; the stable build (v1.0) being released in December 2014. Android Studio 1.1 is now available for download on various OS like Windows, Mac, OS X and Linux. What’s New in Android Studio? Android Studio improves on Eclipse IDE with numerous new features. In the long run, Google aims to replace Eclipse with Android Studio as the primary IDE for developing Android apps. Let’s discover the features of this new IDE! Android Studio gives the advantage of Gradle set of build tools, which replaces Apache Ant. It gives flexibility & extensibility in development and the studio updates don’t affect the output of your build. This unified build system helps to handle different build types & different app versions in a better way. It helps in managing multi APKs through splits, gives multi-dex support and enables dependency management for third-party libraries. Android Studio has brilliant code editing capacity, inherited from IntelliJ IDEA. It helps in refactoring the code, has a better auto completion feature and prediction capabilities and also facilitates code analysis. Android Studio has a redesigned User Interface (UI), where its menu items and tools help in quick and smooth navigation. Its UI design is much faster, responsive and offers more customization options as compared to Eclipse, helping view Android layouts across various screen sizes and multiple languages including API versions. It also has a rich layout designer with a drag-and-drop UI. Android Studio has introduced the concept of modules, where within your project you have various modules like the app you are building can be one module. If you have a library then it can be another module, Ad SDK that you are integrating can be the third one and so on. The benefit is that these modules can separately have their own Gradle build files with their own dependencies, thus making it easier to manage and organize your app projects and resources. Android Studio helps to define unit testing in different classes, allowing you to launch them while developing apps. This ensures that you are aware about your bugs even before they occur during production. Android Studio uses Lint tool to help check your Android source files for the chances of any bugs and suggest improvements in terms of security, performance, usability, accessibility and more. At the time of releasing your APKs, you can change your Grade files to include Lint and it will stop the release process in case of any threats. This thus helps to generate quality code. Android Studio has built-in support for ProGuard tool, ensuring security of your apps. It helps the developers to shrink & optimize code, by removing dead/unused code and renaming classes, fields & methods with complicated obscure names. This tool runs only when you develop your application in release mode, as it is difficult to reverse or back engineer the small size of .apk file. Android Studio also has self signing capabilities, for Android apps. There is a provision for digitally signing the Android application packages, meant for Android package manager for installing the release as well as updates for the application. This provision is there to validate your authority to the manager, ensuring that the app updates are from the same developer. Android Studio offers templates to design analog and digital Android Wear watch faces. They can then be turned into APKs and deployed on Google Play Store as Android apps. Android Studio supports Google Cloud, allowing you to add cloud-based Back end and Endpoints to your app . It also enables adding Google Cloud Messaging feature to send push notifications to all users. Other noteworthy features of Android Studio include updated launcher icons, now packaged as mipmap resources and preliminary support for BCP 47 languages tags. Android Studio thus flaunts many improved features and certainly has an edge over the Eclipse IDE. It gives a simple start, has brilliant code editing features and better options for developing apps from the underlying code. It also has user interface design tools, sample importing and code templates, GitHub integration and much more to offer. Built on the popular Java tool, Android Studio has many look and feel improvements along with the analytical enhancements over its former IDE. 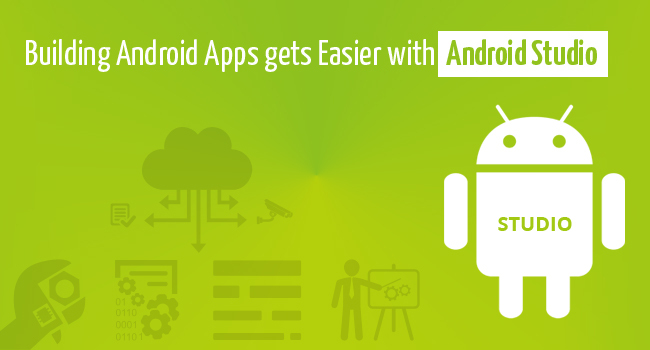 Android Studio is thus an intuitive development platform that helps developers to automate the coding process of Android Apps and has modern, interactive and one of the best IDE packages for developing Android apps. Semaphore Software has the expertise to develop user-friendly and feature-rich Android apps. We are abreast with the latest technology and continuously update ourselves with the most advanced tool and techniques in developing mobile apps on various platforms. We will extend the benefits of this new Android tool and technology to our clients by creating ingenious Android apps using Android Studio. Get in touch with us to avail the advantage of our state-of-the-art Android App Development Services! !